Saskatoon Mayor Charlie Clark says there’s a huge opportunity to develop the downtown core for future generations, including a downtown arena and entertainment district. “When, in the life of a city do you get the chance to put together all the different pieces we’re talking about,” Clark said following his third State of the City address at TCU Place. On Tuesday, Mayor Clark celebrated the recent achievements in the City of Saskatoon, most notably the number of big infrastructure projects that have been completed including the Victoria Bridge, Chief Mistawasis Bridge, overpasses at McOrmond Drive and Boychuk Drive, Merlis Belscher Place at the University of Saskatchewan and the progress with the high-rise condos and Alt Hotel at River Landing. “You can now take an Uber to buy legal cannabis in Saskatoon,” he said. 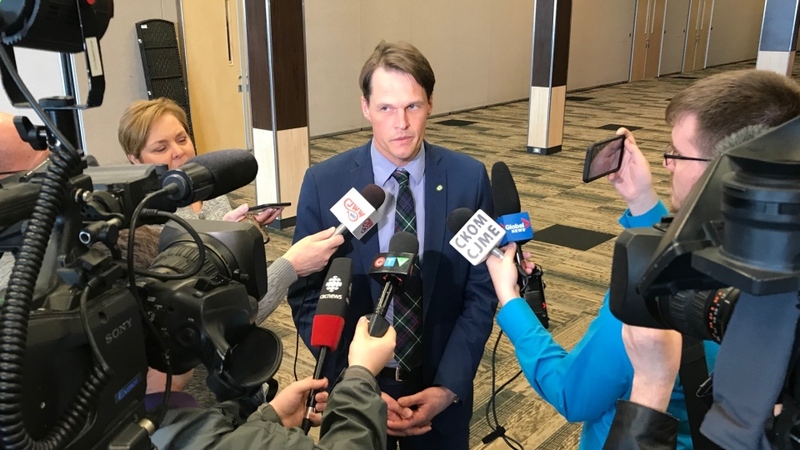 The bulk of Clark’s address was focused on creating diverse opportunities for people in Saskatoon, a reason he joined council almost 13 years ago. Clark said a lack of opportunities creates division in the city. He ended up changing his mind and won a seat on council in 2006. Clark also told reporters he was disappointed with the city’s report that tallied the cost of dedicated bike lanes downtown at $4.6 million.